To investigate the putative modifying effect ofdual antiplatelet therapy (DAPT) use on the incidence of stent thrombosis at 3 years in patients randomized to Endeavor zotarolimus-eluting stent (E-ZES) or Cypher sirolimus-eluting stent (C-SES). 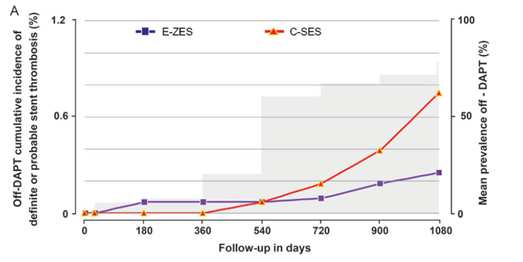 Of 8709 patients in PROTECT, 4357 were randomized to E-ZES and 4352 to C-SES. Aspirin was to be given indefinitely, and clopidogrel/ticlopidine for ≥3 months or up to 12 months after implantation. Main outcome measures were definite or probable stent thrombosis at 3 years. Multivariable Cox regression analysis was applied, with stent type, DAPT, and their interaction as the main outcome determinants. Dual antiplatelet therapy adherence remained the same in the E-ZES and C-SES groups (79.6% at 1 year, 32.8% at 2 years, and 21.6% at 3 years). We observed a statistically significant (P = 0.0052) heterogeneity in treatment effect of stent type in relation to DAPT. In the absence of DAPT, stent hrombosis was lower with E-ZES vs. C-SES (adjusted hazard ratio 0.38, 95% confidence interval 0.19, 0.75; P = 0.0056). In the presence of DAPT, no difference was found (1.18; 0.79, 1.77; P = 0.43). A strong interaction was observed between drug-eluting stent type and DAPT use, most likely prompted by the vascular healing response induced by the implanted DES system. These results suggest that the incidence of stent thrombosis in DES trials should not be evaluated independently ofDAPTuse, and the optimal duration ofDAPTwill likely depend upon stent type (Clinicaltrials.gov number NCT00476957).